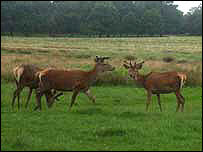 Richmond Park, the largest open space in London, attracts millions of visitors every year to its acres of grassland, woodland and its herds of wild deer. Most of those visitors arrive by car and some people use the park as a convenient rat run to avoid busy commuter traffic. 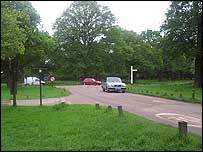 But, under a controversial scheme to reduce traffic in the park, one of the main entrances is to close and one of the car parks reduced drastically in size. The measures are being introduced after a consultation exercise which saw much opposition to proposed road closures in the park. Opposition has also come from the three boroughs which border the park who say the displaced traffic will lead to a nightmare for local residents. Robin Hood Gate, which allows access from the busy A3 trunk road, will be closed to traffic later this year. The Royal Parks Agency (RPA), which manages the park, says action is necessary to safeguard wildlife and the environment. RPA spokesman Theo Moore said it was the least disruptive course to take. "There were initial proposals for more extensive re-routings and closures and it's been whittled down to just this one," he told BBC News Online. "It's what will have the least negative impact and bring the most benefit to that part of the park." A survey in 1998 found that up to 3,800 cars an hour entered the park at peak times and 96-8% of that was through traffic. Even at weekends, 80% of people were using the park as a cut through rather than to visit. But the three neighbouring boroughs, Wandsworth, Richmond and Kingston, are concerned about the effect on surrounding roads which will have to bear the displaced traffic. Councillor Kathy Tracey, Wandsworth Council's cabinet member for transport, said there had been a "tremendous influx" of traffic on residential streets on previous occasions when Robin Hood Gate was closed - including during the 2001 foot and mouth outbreak. "We're putting in traffic calming measures and trying to block access roads in the neighbouring estates," she told BBC News Online. "But an extra 700 vehicles during the rush hour will block the A3 at Roehampton Lane." Ms Tracey said other options should have been considered such as putting in cattle grids to deter some drivers or only closing the gate at peak times. "A motorist has as much right to go through the park as pedestrians," said Ms Tracey. "They have as much right because they pay for it." 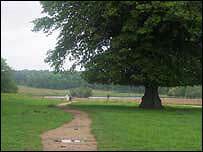 Richmond Park is home to hundreds of wild red and fallow deer - a legacy of its origins as a royal hunting park enclosed by Charles I in 1637. It also has a landscape of grassland, bog and bracken, wetland and ancient trees which led to it being designated a Site of Special Scientific Interest and a National Nature Reserve. The car park at the popular Pen Ponds, which can currently accommodate about 300 cars, is going to be reduced to about 90 spaces despite a petition opposing the measure signed by 16,000 people. "We are not trying to keep people out - we want people to enjoy the park - it's a jewel - but we need to strike a balance," Mr Moore said. "For instance there are no nesting waterfowl on Pen Ponds because of disturbance from people walking and picnicking nearby." Transport for London (TfL) said it would have to carry out improvements to the A3, which will have to take much of the extra traffic, before the closure takes place. The RPA said the closure of Robin Hood Gate is for a 12-month trial period with reviews after three and six months.